Yama and niyama means practicing the controlling process by following strict regulations, and āsana refers to the sitting postures. These help raise one to the standard of faithfulness in devotional service. The practice of yoga by physical exercise is not the ultimate goal; the real end is to concentrate and to control the mind and train oneself to be situated in faithful devotional service. Devotional service, or bhakti yoga, is the best method for achieving transcendental realization. In today’s society, the term “yoga” is generally associated with gymnastics poses and various breathing exercises. However, yoga is a term originating from the Vedas and it means to have union with the Supreme, or God. Yoga is meant to be a completely spiritual activity. There are various types of yoga, such as jnana yoga (meditational/contemplation), karma yoga (fruitive activity), and hatha yoga (body positions/exercises). 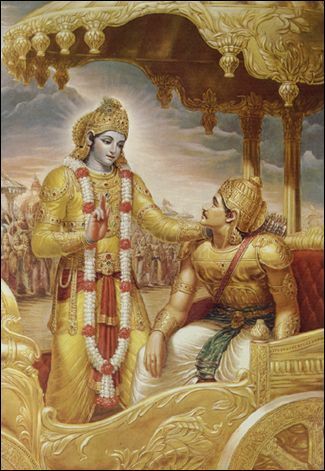 Lord Krishna, the Supreme Personality of Godhead, describes all of them in detail in the Bhagavad-gita. Of all the different types of yoga, bhakti yoga is considered the highest since it involves loving devotion to God. Though devotional service can be classified as a means of self-realization, it is actually the natural disposition of all living entities. We are all part and parcels of God and it is our true nature to love him. Through contact with material nature, we have forgotten this relationship. Bhakti yoga is the way for us to reconnect with Krishna. Lord Krishna Himself states that no one is dearer to Him than His devotee. His bhaktas, or devotees, have pure love for Him, and the Lord reciprocates. The Lord is generally neutral towards all living entities, but He goes to great lengths to favor and protect his bhaktas. He even states that worshipping His devotee is as good as worshipping Himself. Engaging in any or all of these processes will make one’s life perfect. 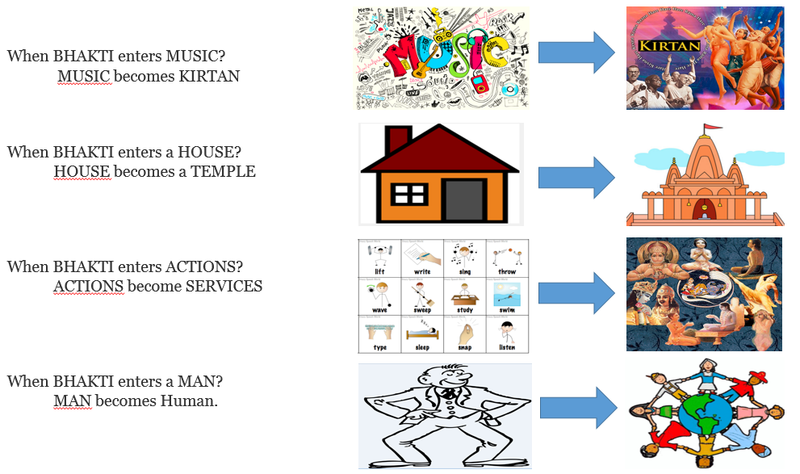 For each of these processes, Vedic literature has examples of great souls who achieved perfection by practicing them. Religious life is often viewed as being very strict and austere, and requiring great renunciation. Devotional service is above all religious regulations and austerities. Bhakti means love, and it is the natural inclination of everyone to love someone else. So why not try the yoga of love? These processes aren’t very difficult to perform. They don’t take much time and they don’t require any renunciation. In fact, renunciation from sinful activity automatically comes to those who follow the path of devotional service. 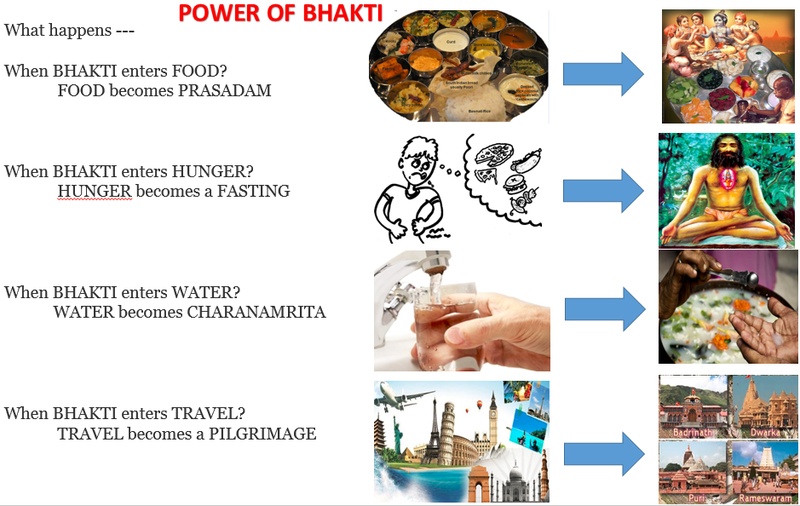 The power of bhakti is immeasurable. Bhakti makes everything transcendental. 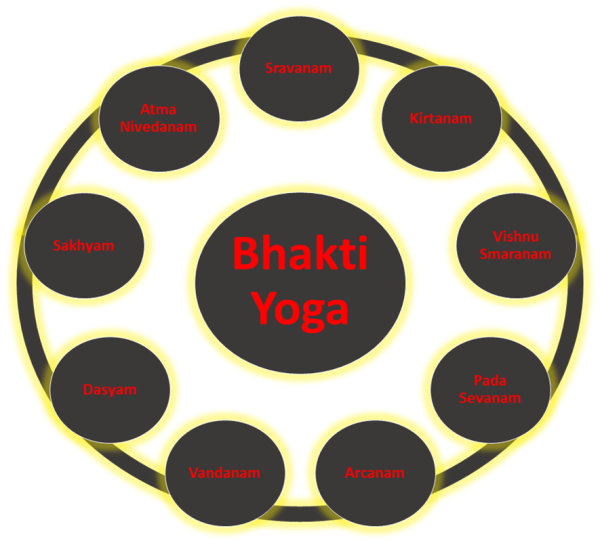 The culmination of all kinds of yoga practices lies in bhakti-yoga. All other yogas are but means to come to the point of bhakti in bhakti-yoga. 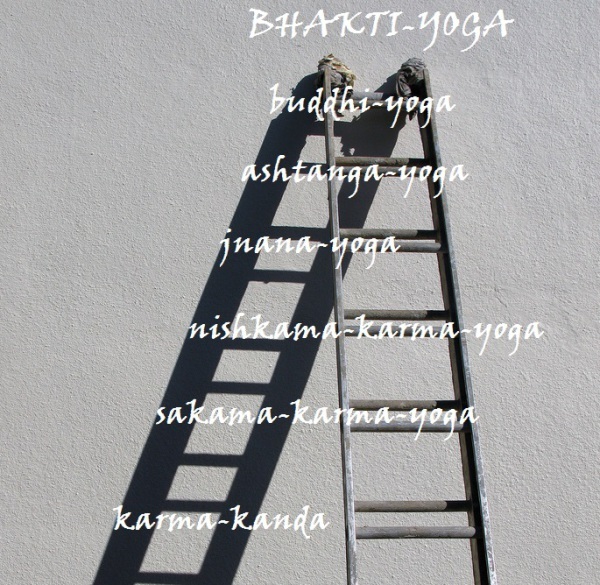 Yoga actually means bhakti-yoga; all other yogas are progressions toward the destination of bhakti-yoga. From the beginning of karma-yoga to the end of bhakti-yoga is a long way to self-realization. Karma-yoga, without fruitive results, is the beginning of this path. When karma-yoga increases in knowledge and renunciation, the stage is called jñāna-yoga. When jñāna-yoga increases in meditation on the Supersoul by different physical processes, and the mind is on Him, it is called aṣṭāṅga-yoga. And, when one surpasses the aṣṭāṅga-yoga and comes to the point of the Supreme Personality of Godhead Kṛṣṇa, it is called bhakti-yoga, the culmination. Factually, bhakti-yoga is the ultimate goal, but to analyze bhakti-yoga minutely, one has to understand these other yogas. The yogī who is progressive is therefore on the true path of eternal good fortune. One who sticks to a particular point and does not make further progress is called by that particular name: karma-yogī, jñāna-yogī or dhyāna-yogī, rāja-yogī, haṭha-yogī, etc. If one is fortunate enough to come to the point of bhakti-yoga, it is to be understood that he has surpassed all the other yogas.